Between Q1 2016 and Q1 2017, Viridian Capital Advisors tracked 439 cannabis investment deals, totaling $1.92 billion capital raised across 12 segments of the industry. 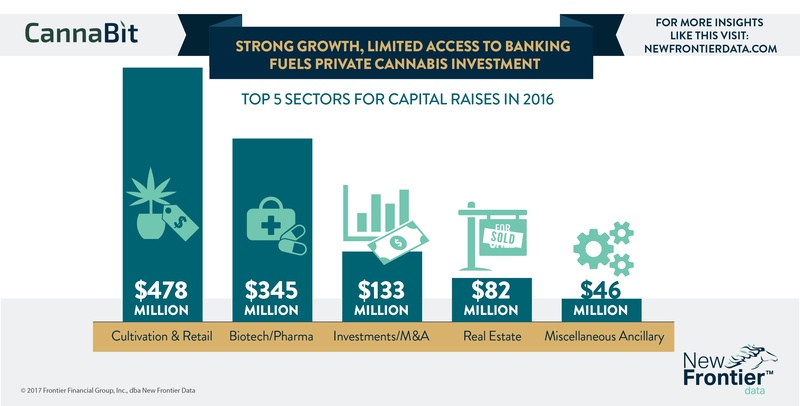 The top performing sector – cultivation & retail – saw nearly half a billion dollars in new investment to meet the market’s surging demand and entry into newly legal markets. Cannabis-related pharmaceuticals and biotechnology have also seen continued high investment as the science of medical cannabis have become more robust. Despite the impact of federal prohibition on cannabis research, private investment continues to fund both therapeutic research and development of novel delivery mechanisms. While the Investment/M&A sector was the third highest performer at $133 million in raises, this is an area where investment is likely to grow as more operators use Mergers & Acquisitions as an expansion strategy. Real estate raised $82 million in 2016, but future investment in this sector may be heavily influenced by whether new markets tightly restrict the number of new licenses or there are enough operators that it creates highly competitive environments for prime locations. As new markets adopt adult use and medical programs Cultivation & Retail and Biotech/Pharma space will continue to lead cannabis investing given the key roles those two sectors will play in the operationalization and scientific advancement of the industry respectively.